An indoor growing operation may not seem like an overly complicated thing to set up, but if you’re going to do it right it requires a lot of planning and preparation beforehand. If you don’t understand what light has to do with the whole growth process for plants, it’s probably a good idea to hit the pause button right now and go back and do some research. A good place to start is the information articles on this site. If such basic information isn’t foreign then you should still exercise caution and make sure you’re choosing the right equipment for the job. 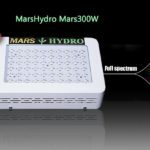 While you don’t necessarily need a lighting system with more than 1000W it certainly won’t hurt and it will help to ensure that your plants are getting the amount of light they need. 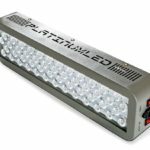 One of the more powerful LED lighting options out there is the VIPARSPECTRA 1200W system; while it’s not the cheapest system around it is an effective one – be prepared to pay just under $1000 for this system. 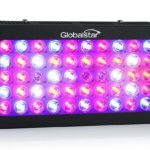 This system provides a full spectrum of light for your plants, which makes it appropriate for use throughout the growing cycle. A good grower should adjust the amount of exposure to light that their plants get to mimic the different seasons – that means a lot more light at the beginning of the growth process and gradually less as you go through the process. This VIPARSPECTRA system is ideal for this process with its full spectrum of light on offer, and it even provides infrared light to help with cell division. In order to keep this lighting system cool the manufacturer has included six separate cooling fans built right into the light tray. With a powerful light such as this that pumps out 1200W, it’s not unexpected to find a little extra cooling power, but six separate cooling fans is pretty impressive. It also includes aluminum heat sinks that further dissipate the heat produced in the lighting process. 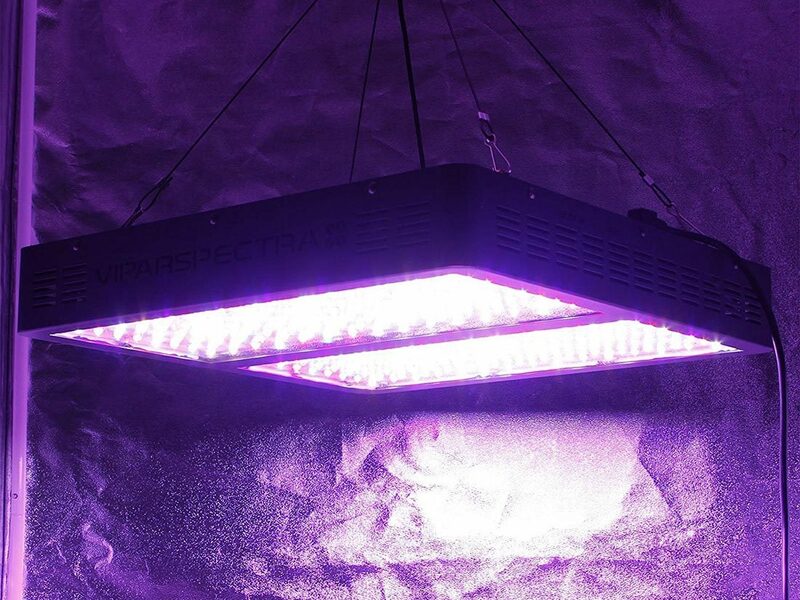 Overall, you can expect this lighting system to be up to 70% cooler than a traditional HID lighting system. 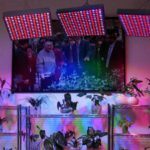 Lighting systems that simply include bulbs representing the different colors of the spectrum, but don’t provide you with a way to turn certain ones on or off, will do a decent job – they just won’t provide your plants with the optimum growing conditions. 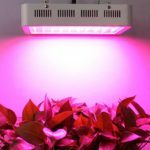 If you want to provide your plants with the best indoor growing conditions you have to be able to manipulate the type of light the plants receive at different times in their growth cycle. This system has different switches that allow you to alter the lighting that’s emanating from it – there is a vegetative switch and a bloom switch. The vegetative switch will reduce the red light and increase the blue light and the bloom switch reverses this. 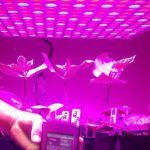 Having this level of control of your lighting system is ideal for maximizing your plants’ growth potential. This product by VIPARSPECTRA may be rated at 1200W, but that doesn’t mean it will draw that much from your electricity resources. According to the manufacturer, this lighting system only consumes about 524W of power, but is still capable of producing the equivalent of 1200W of output that you would receive from traditional lighting systems. That’s an impressive difference that will put a lot more money back in your pocket. There is no doubt that this lighting system has some cost involved upfront, but the long-term savings are obvious. One of the first things I look at when purchasing any product is what type of warranty it comes with, and the industry average for LED lighting systems seems to be about two years. This is another area where this product excels. It comes with a three-year warranty and, for the most part, if your system is still working after three years you’ve probably gotten your money’s worth and more. 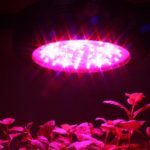 The size of the grow area that an indoor lighting system will cover varies from product to product, but they’re usually not much more than a couple of feet. This system is designed to cover a growing area of about 4’ x 4’, which isn’t mind-boggling, but it’s about average. When you consider the amount of light the plants underneath it are being exposed to, it’s actually more impressive than most. If you’re wondering what comes in the package for this product you’ll be happy to know that along with the lighting system it also comes with the hanging wires to suspend the system above your plants and a fairly long power cord to plug into your closest outlet. If you’re buying a lighting system that doesn’t include these features you might want to rethink your purchase. There are always some concerns with any product, but I have to say I was pleasantly surprised that there were very few major concerns directed at this system. Some customers suggested that the rear of the lighting system does get quite hot, contrary to the manufacturer’s claims, but that’s a complaint disputed by others. You’re always going to have some heat from a lighting system – it’s unavoidable. What’s not in dispute is the fact that LED lights admit far less heat than traditional lighting systems. The other minor concern that customers had with this product was the inconsistent wattage actually produced by the lighting system. While the manufacturer claims that it’s a 1200W system, some customers suggest that it only pumps out about 900W; while that is a bit of a difference it’s not unusual by any means. 900W is still a lot of power to put into a lighting system and is likely more than adequate for anybody’s growth needs. 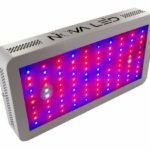 In spite of the expense associated with the VIPARSPECTRA 1200W system, it still has to make my short list as one of the best indoor LED lighting systems for a grow operation available on the market today. There’s no doubt it’s a powerful lighting system, but I also liked the fact that it gives you some control over which lights take the lead at any given time. This type of functionality is perfect for making sure your plants have the best possible chance to succeed. This is definitely a system worth your taking a second look.